I have an application written in ASP.NET Core 2 that uses Windows authentication: for now, when a user (previously connected to the PC and the domain) opens the browser (IE), the login form is opened, asking for the user and password; typing the correct credentials the user accesses the application, but I would like it to be an "automatic login", without re-typing the user and password; my impression is that the configuration of the identity of the application pool associated with the site is wrong: what kind of privileges should this user or group have? Do you have any suggestions for checking it? Your describing the default behavior of Windows Authentication. Take a look at the docs and make sure the app is configured correctly. Thks, I've configured like the document say, but the result it's the same: note that launching the app with visual studio all works well (the autologin too). Regarding the identity application pool: using prebuilt groups (local network, local system, etc.) can be the configuration problem? Label1.Text = User.Identity.Name & " is a manager"
Label1.Text = User.Identity.Name & " is not a manager"
Based on your description, it works under VS, but failed from IIS. 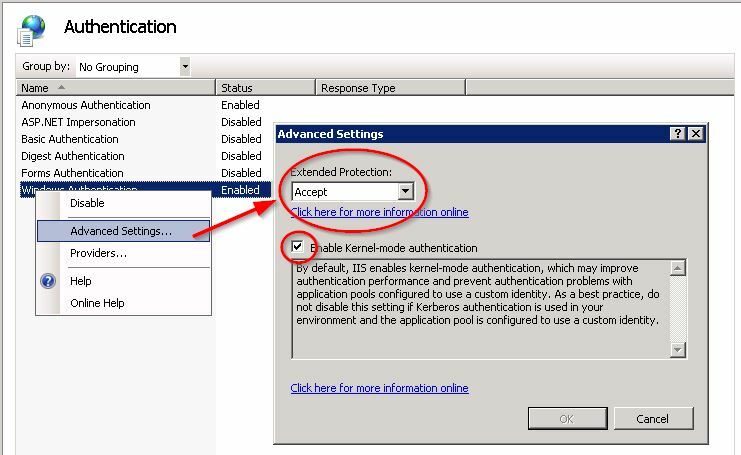 Do you try to publish to the development environment IIS which is the same computer which works with VS, and try to access it, will you receive prompt dialog? I made a test with publishing to IIS, I did not receive prompt dialog. I suggest you check whether “Enable Kernel-mode authentication” is enabled. Is the site in the intranet zone ? You can see that by using "Properties" on the context menu. Yes, I did exactly as indicated on the page but the problem persists. It happens to have configuration problems in the production environment, how can I debug to figure out where the problem is? My idea is that the configuration of the domain server does not allow the user impersonated by IIS to do "autologin", can this be? what kind of privileges should you have? Regarding the site's zone, on Properties I found "Trusted sites | Protected Mode: Off"; can be the problem? No, that sitting works with IE and the O/S starting with Vista to protect IE and the O/S from being attacked from the Internet. Summary In Windows Vista, Internet Explorer 7 runs in Protected Mode, which helps protect users from attack by running the Internet Explorer process with greatly restricted privileges. Protected Mode significantly reduces the ability of an attack to write, alter, or destroy data on the user's machine or to install malicious code. I'm not 100% sure but trusted sites are 3rd party sites you trust so here it seems to me it could be better to let the trusted zone with its default settings and move your internal site to the intranet zone. Edit: according to http://www-01.ibm.com/support/docview.wss?uid=swg22001307 the default is "Automatic logon only in Intranet zone". I believe a common misconception is that the "trusted zone" is more trusted than intranet sites when they should be "intranet internet trusted sites" (and by default you have no site at all in this zone).